Kraftwek may have written the song "Computer Love," but Darrin Wiener, a.k.a. 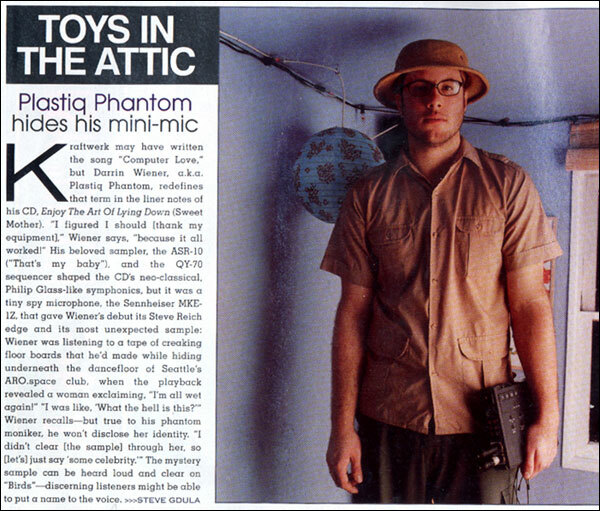 Plastiq Phantom, redefines that term in the liner notes of his CD, Enjoy The Art Of Lying Down (Sweet Mother). "I figured I should [thank my equipment]," Wiener says, "because it all worked!" His beloved sampler, the ASR-10 ("That's my baby"), and the QY-70 sequencer shaped the CD's neo-classical, Phillip Glass-like symphonics, but it was a tiny spy microphone, the Sennheiser MKE-1Z, that gave Wiener's debut its Steve Reich edge and its most unexpected sample: Wiener was listening to a tape of creaking floor boards that he'd made while hiding underneath the dancefloor of Seattle's ARO.space club, when the playback revealed a woman exclaiming, "I'm all wet again!" "I was like, 'What the hell is this?'" Wiener recalls -- but true to his phantom moniker, he won't disclose her identity. "I didn't clear [the sample] through her, so [let's] just say 'some celebrity.'" The mystery sample can be heard loud and clear on "Birds" -- discerning listeners might be able to put a name on the voice.